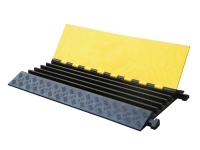 Although Heavy Duty Cable Covers often go undetected by the untrained eye they are highly important to ensure that both pedestrians and valuable cables are protected. 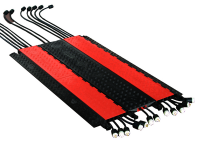 These HD cord covers are required to be highly durable and long lasting. 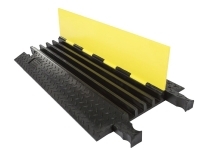 Therefore, Heavy duty cable covers are primarily designed from either high density polyurethane or Rubber. 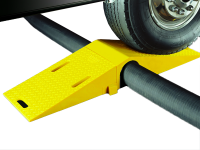 In order for Cable protectors to be considered "Heavy Duty" they must be rated to withstand more than 10,000 Lbs of weight Per Axle. 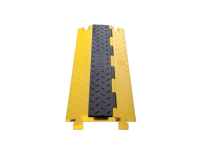 Thus, cable protectors are not only designed to keep pedestrians safe from tripping hazards but also stop heavy cars, trucks and other vehicles from damaging wires under their weight. How To Choose Which Cable Protector Will Work For you. 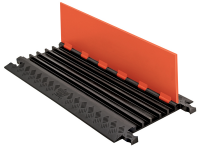 When deciding which cable protector is best suited for your job or application it is imperative that you know the exact size and quantity of wires or hoses you plan to protect / conceal. This will allow you to accurately pick the corresponding size of the channels in the cable protector and the amount of channels required. 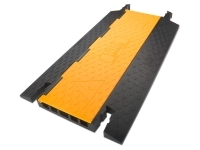 After you have correctly determined what Size of cable protector you will need you should begin to think about who or what will be walking, driving or rolling over the cable covers. 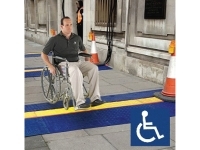 In applications where you will have high numbers of pedestrians crossing over, visibility is generally a larger concern. 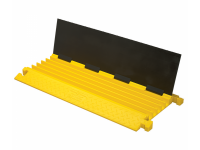 For increased visibility it would be well thought out to buy cable protectors that have bright safety-yellow or orange lids to grab the attention of those walking over or around the cable protectors. 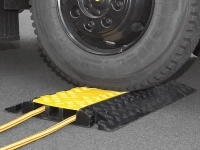 On the other hand, when you plan to have heavy cars, trucks or forklifts driving over the cable protector it would make sense to buy heavy duty cable protectors that are rated for 18,000 - 40,000 Lbs Per axle to ensure that your investment will not be damaged under repeat crossings. 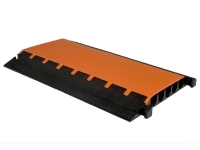 Lastly, ADA and low profile cable protectors are specifically designed for applications where those individuals that are in wheel chairs can easily cross over the cable covers. If you already own a certain brand of cable protectors you are somewhat limited to which cable covers will work for you. Cable protectors all have male connectors and female reception ports. 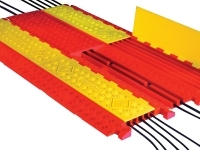 Therefore, when buying a cable protector to match with existing units you need to ensure you have a matching connectors. 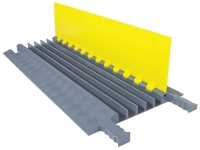 Military: Heavy Duty Cable Protectors can be seen regularly in many military facilities around the country and world. 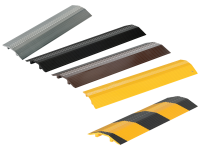 They are generally used to cover cables connecting exterior Datacom / Telecom Installations or hoses in maintenance facilities. 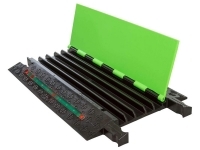 Event Production: If you have been to a medium to large scale concert or festival or Fair I would feel comfortable guaranteeing to you that numerous cable protectors were used to cover and protect power cable runs. Film Production: Behind the scenes of many film sets there are hundreds of power and audio-video cables lining the floor or ground. The last thing any reputable production company wants is a celebrity tripping on loose cables and potentially hurting themselves in the process. Construction: Many job sites will often have numerous hydraulic hoses or power cables connected to required tools. 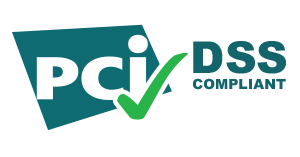 Make sure you follow standard regulatory requirements and keep your workers safe from any potential hazard. Facility Safety: Heavy duty cable protectors are also commonly found in warehouses and manufacturing facilities where potentially dangerous machinery or equipment is present. 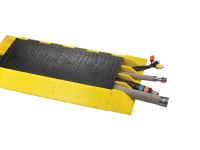 Cable protectors again are needed to ensure that all tripping hazards are eliminated. 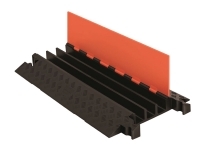 Cable Protectors are available in two vague formats, drop-over cable protectors & cable protectors with open close lids. 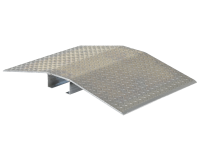 The advantages of drop over cable covers tend to be in ease of installation for existing cable/hose runs where picking up and moving the cables is not an option. 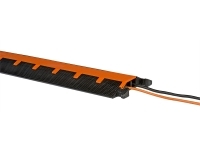 Further, Drop over cord covers often cost less, due to there lighter weight construction, yet this also means they cannot handle as much weight. 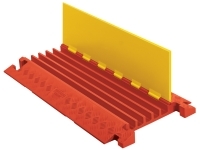 Cable protectors with lids are the most popular style of cable protector. As the name suggests the top of the cable protector can open or close when you need to remove or add anything inside. 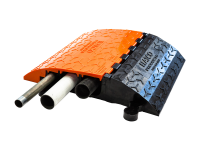 Cable Protectors with lids are also rated for heavy duty weight capacities and certain models will even withstand up to 800,000 Lbs. Rubber Vs Polyurethane, the classic cable protector rivalry... 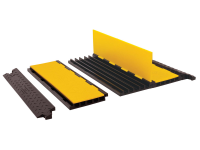 There are a few things to consider when deciding between one or the other; First, the cost of rubber cable protectors are generally much lower without sacrificing any significant quality. However, Rubber cable protectors are considerably heavy making more difficult to transport by hand. 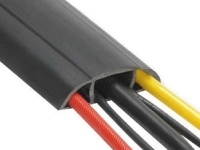 Instead, Polyurethane cable protectors are lightweight and tend to boast higher weight capacities. 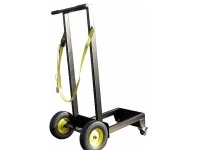 When required to transport multiple cable protectors at once it may be better to purchase a cable protector transport cart that can hold up to 10 cable ramps at one time. 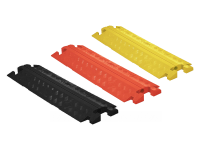 Nevertheless, if you don't feel like investing in a easy transport cart you can always use the built-in grips on the under side of all standard cable protectors to make carrying the cable cover much easier.